Sometimes we discuss the possibility of spending a night in the W hotel. It's no more than 2 miles from our house but the allure of their perfectly comfortable beds beckons to us from memories of happy nights we slept at the Ws in Seattle and San Diego. I fondly recall how Zoë at the W in New Orleans saved me many times from the dreadful food at the conference centre opposite, a fact which recently caused me to wonder why I had resolutely decided to never give the restaurant at San Francisco's W a chance. The answer to the question was clear. Only tourists eat at W hotels, don't they? Why on earth should I play and pay at being a tourist in my own town? For the sake of writing this piece for my SFist column, playing at being tourists is exactly what I did last weekend when I convinced Fred and a group of friends, to join me for dinner at XYZ, the restaurant and bar attached to our very own Bay Area W hotel. It was no surprise to note that we had all dressed up for the occasion without being prompted - it's just the stylish kind of place that implies that you have to at least try to make some kind of effort. At 8.45pm, The Living Room was already noisy and crowded so we slunk upstairs to enjoy apertifs in XYZ's lounge-style bar hidden behind the beaded curtain. At that time on a Saturday night the XYZ bar was not even half full. We received prompt and pleasant service before settling on a balcony banquette overlooking our dining spot. Strong cocktails and large glasses of wine paired with the lively conversation that flowed as we mixed old friends with new put us all in a convivial mood. At that point I guessed that whatever happened, we were going to have a good night. Everyone was in exactly the right mood, we were all the same wavelength and each of us was one hundred percent up for whatever the evening had in store. After about twenty minutes of gossiping and with our drinks not quite finished, we meandered back downstairs to claim our table in the dining room. Our enthusiastic server bounded over to welcome us in a style that can only be described as jolly, putting the coolness of the entire W operation in jeopardy. I can't complain about his cheeriness, but his description of the soup as "finished with dash of cream" should be called in to question. To the contrary, my appetiser turned out to be more like a luke warm bowl of cream "finished with a dash of some vegetable" (sunchoke, cardoon and lemon oil, apparently). In fact, nary a vegetable could be distinguished in the myre although a hint of lemon did just about burst through and make itself known to the table before disappearing behind a creamy-white cloud. Instead of licking the bowls clean we attacked a pinot noir (or two) instead and no one seemed to notice as the entrees came and went. I can just about remember the sweet little ball of granita that garnished a small plate of glistening hamachi sashimi. I recall trying a forkful of pasta from someone else's plate that was nothing more than ordinary. Another friend's duck, whilst not bad, just wasn't worth the effort of finding more words for. It was ordinary too. Nevertheless it was one of those merry evenings. With dessert wine they brought us two plates of complimentary little sugary treats from the chef. It was a nice gesture and one they could afford to do at the steep prices they charge. But simply acting like a high end restaurant wasn't enough for me to drastically change my perception of a W hotel restaurant being a place better suited to unknowing visitors. It occurred to me later, and my friends agreed, that we had spent a very un-San Francisco kind of evening - it almost really was like being tourists in our own town. Sometimes I need a feeling of a change from my humdrum schedule and the W delivers well on its particular brand of escapism. By the time we left XYZ's restaurant, a hefty $60 lighter in each of our pockets, the W's bar and Living Room were both too overcrowded to comfortably accommodate us, so we sauntered a block North to people-watch, way-too-high-for-San-Francisco-shoe-watch and bizarre-collection-of-fashion-faux-pas-watch over a refined night cap at the St Regis. We wonder how long it will take before the cool young kids down at the W discover there is another, even more 'trendy', place to hang out, only a stones-throw away? Archive Alert! This time in 2005: One of my favourite posts - Teaching Tim Vinny's Chicken Scarpelli! 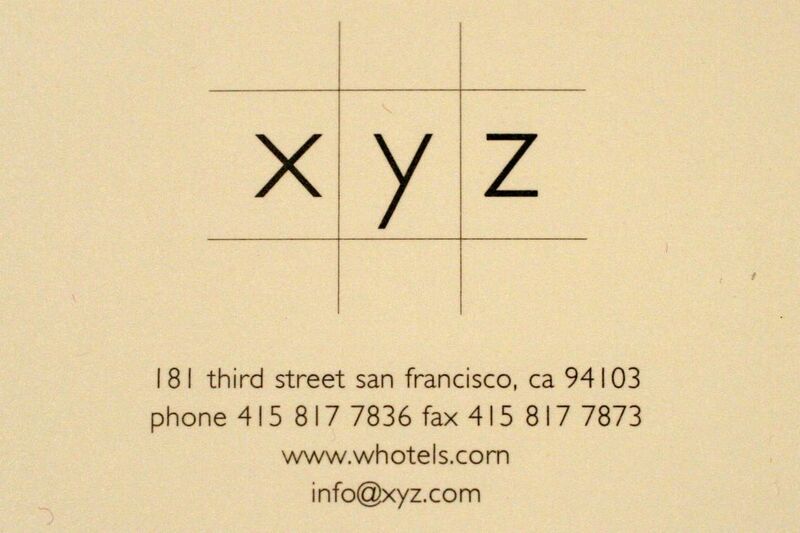 I had a horrible meal at XYZ where dishes were described wrong, were served wrong and tasted wrong. The service was pathetic. Without even a complaint, the manager came over to apologize and lop a fair amount off our bill. That had to be a first. And their excuse? They weren't expecting so many people because of a convention. I should mention not only did we have a reservation but they are across the street from a convention center! To not expect conventioneers is just ridiculous.